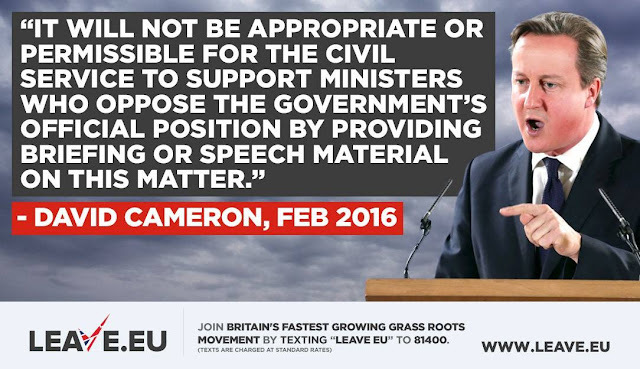 David Cameron has banned MPs' advisors on the public payroll from helping their MP campaign to leave the EU whilst allowing those working for pro-EU MPs to produce pro-EU propaganda. Under new rules, civil servants working for MPs who are campaigning to stay in the EU will have full access to government briefings and will work on promoting the EU during the normal working day when you and I are paying their wages. But civil servants working for MPs who are campaigning to leave the EU have been banned from receiving government briefings and are only allowed to promote their MP's leave campaigning in their personal time. The remain campaign will have double the spending limit of the leave campaign thanks to political parties being given spending allowances, the purdah rules have been changed to allow local councils and quangos to spend taxpayers' money to promote the EU, both EU-funded state broadcasters - Channel 4 and the BBC - are promoting the EU and now our taxes are being used to fund covert state propaganda using civil servants. This is the sort of thing you expect to find happening in Zimbabwe, not the UK. The only way this will be stopped is with a court injunction banning the remainians from abusing their power to fiddle the referendum. This should be on the to-do list of whichever group is officially designated by the Electoral Commission, along with a request to the UN for international observers to stop any more such abuses of power from taking place.